This year’s concept was inspired by William Shakespeare’s comedy; tickets for the general public are priced at $450 pesos. Every year the San Pancho Children’s Circus puts on a fabulous presentation at the Bodega Circo to show off their hard work and progress, while raising money to fund this dream come true that takes place in the Cultural Capital of the Riviera Nayarit. Gilles Ste-Croix, co-founder of the Cirque du Soleil, is the founder and creative director of the San Pancho Children’s Circus. Together with his team he has prepared a brand new show that will take the stage March 22-25, 2017, with one presentation per night starting at 7:30 p.m. The show is called “A Midsummer Night’s Dream,” a concept inspired by the Shakespearean comedy of the same name. The theme involves wood nymphs and elves, with different artistic numbers interacting amongst themselves. The 85 little but grand artists who are partaking in the production will present over 15 different circus acts. The story will be mostly pantomimed as opposed to verbal, so there will be a great display of costumes, masks, makeup, illumination and a mysterious aura. The mission of the Children’s Circus is to holistically develop both kids and teens through art, creativity, communication and the strengthening of their self-confidence to take part in these risky acrobatics, all within the confines of a safe and controlled environment. Tickets are on sale for $450 pesos for the general public (kids under two are free). Reserved seating is available for donors and sponsors of the Dreamcatcher Foundation, which supports over 150 families involved in the project; these are available for $2,500 pesos each. Tickets are available at the Bodega Circo in San Pancho from Monday through Friday from 5 p.m. to 6 p.m. and during the morning at the Sayulita and San Pancho markets on Fridays and Tuesdays, respectively. 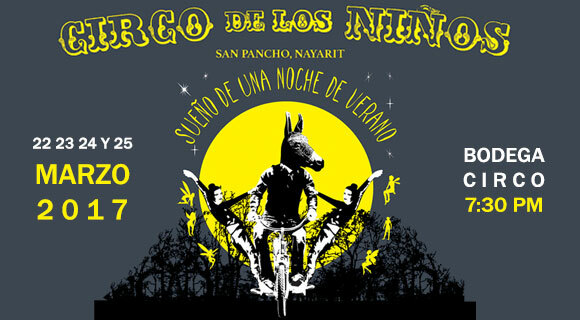 There can also be purchased online at: www.circodelosninosdesanpancho.mx.